A vibrant older city, Boston's important historical landmarks have become increasingly hidden among today's urban construction. This book makes these buildings come alive again, and provides a fascinating version of the first two centuries of Boston history. It is divided into four periods - Colonial, Provincial, Federal, and Greek Revival, and fully illustrates and describes 57 important buildings. It also provides each location on maps of downtown Boston and the greater Boston area. 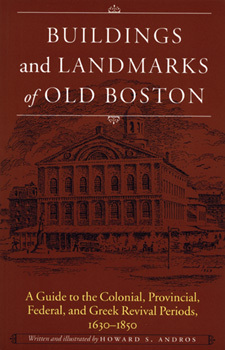 Any armchair historian, anyone planning to visit Boston, or who lives in Boston will love this great new book.